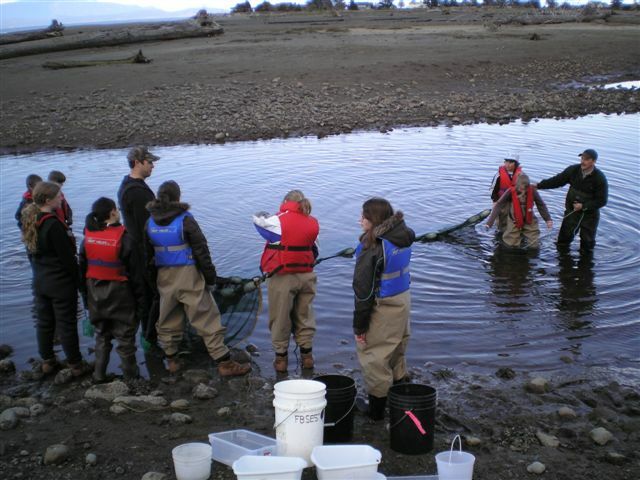 It is a part of our mission to share information, education, public awareness, and equipment resources with Oceanside communities and schools to help complete streamkeeping and stewardship projects. MVIHES aims to foster the development of lifelong respect, understanding and care for the environment by providing educational resources and learning opportunities with a focus on local watersheds. This area of our website provides information on the types of educational services we offer our community. If you would like any information about any or our programs, or assistance with a stewardship project in your community, please Contact Us. Written on 27 March 2008 . The Streamkeeper Certification training course is an excellent introduction to fish habitat and stream restoration. This two-day course educates participants about stream habitat, promotes a stewardship ethic and informs participants about stream protection and restoration options. A storm drain collects rain and melted snow that runs off hard surfaces such as roads,roofs,parking lots and driveways. They empty into underground storm sewer systems. Many of these storm sewers discharge their contents directly into local waters, which are important for recreational activities, as well as habitat for fish and other aquatic wildlife. In line with our mission, MVIHES raises public awareness through education at many public events. This program is intended to promote wise water and pesticide use in the Oceanside area. Every year local residents choose not to water their lawns in summer. 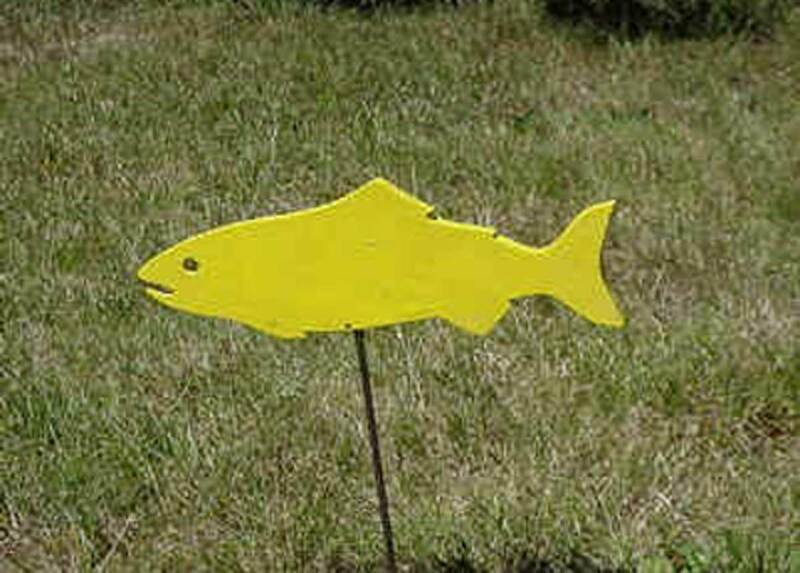 The yellow fish displayed on their dry lawns and boulevards tells others that they are conserving water for salmon habitat in the Englishman River. They want to help minimize the effect of the low summer flows that decrease fish habitat and cause water temperatures to rise. We tend to use the most water when the river can least afford it. 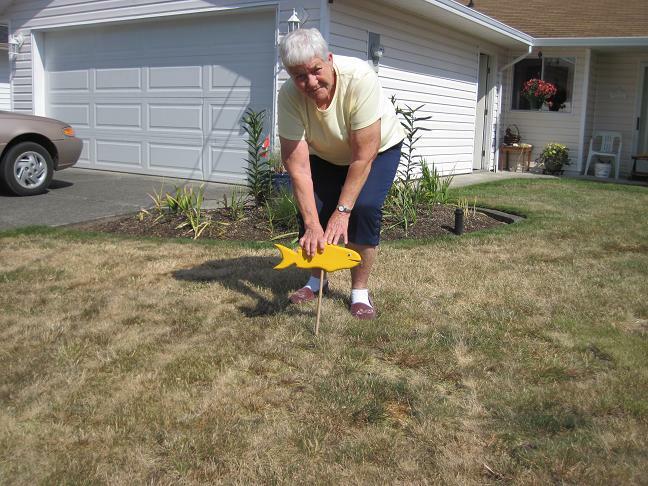 MVIHES has been running a Salmon Friendly Lawn program for several years and has handed out hundreds of the yellow fish ornaments. To receive a yellow fish, the homeowner must pledge to not use pesticides on their lawns or water them from the tap. Project Coordinator, Faye Smith, explains, “Here on the East Coast of Vancouver Island, we live in a Mediterranean climate zone where we always experience a period of drought in late summer”. Because of that, grasses are used to going dormant then, so keeping lawns bright green should look “unnatural”.